108Kg Weight Set: 6 x 1.25Kg cast iron weight plates. 6 x 2.5Kg cast iron weight plates. 2 x 5Kg cast iron weight plates. 2 x 10Kg cast iron weight plates. 2 x 15Kg cast iron weight plates. 1 x 150cm barbell bar - 10Kg. 1 x 120cm EZ Curl bar - 8Kg. 2 x 2.5Kg 35cm dumbbell bars. This workstation is very robust, and also adjustable. I’ll start with the bench / rack part and then move on to the extras / accessories. The back rest for the bench has 6 height settings, this is from completely flat to around 45 degrees. You can switch it up for butterfly curls or presses as needed. You’ll get thick padding which can be wiped clean, the hardware is white and the padding black (classic good looks!). There is a rack for the barbell which is height adjustable. When you look at the picture gallery, you will see that there are different configurations. With the leg press and curl bar optionally at either end. This gives you flexibility. If you have the space, you can have both in place. If not, then the one you use most can be the main fixture, with just a 5-minute switch over needed. One buyer expressed doubt over the fittings for the curl bar, which looked like 30kgs was enough for them! I have not seen any evidence of these breaking off though. Some assembly is required. Some people found this easy, others not so much! I do recommend that you think about flooring too, a rubber mat is ideal. You’ll get a 30mm set (obviously this is not compatible with 1 inch weights), with 108KGs of cast iron weights. This should be plenty for most of us, though you can purchase more free weights separately. These have a screw cap system. Note that the total recommended weight for the Gorilla Sports Universal Workstation is 280kgs (44 stone). Above this is at your own risk. Dumbbells come with this gym, adding extra flexibility to the range of exercises you can do. Overall, there is a lot of praise for the gym unit. This workstation did lose a couple of stars by arriving incomplete (in 2 cases) and for having ‘confusing’ assembly instructions. Hopefully, those logistical issues have been resolved by now. Overall, Gorilla Sports has a good reputation for service. Some users asked about extra weight possibilities. Feedback here indicates that this can be done, buying more 30mm weights is simple enough. Take care that you are staying within the recommended total load if you are going to do this. In general, the size and robustness of this workstation came in for a lot of positive comments. I expect we will see the overall feedback improve as those logistics issues get worked out. This is a solid workstation which can cover a lot of options. 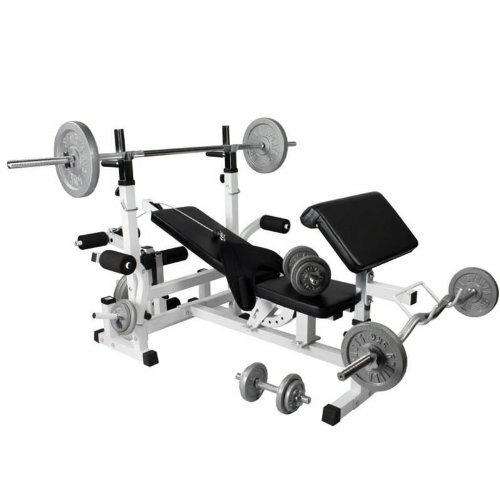 It comes with curl and leg stations, as well as a fully adjustable bench / rack setup. Topping it off, the cast iron weight set should last and last. So far, the buyer feedback has been good. Everyone loved the unit, with only the assembly and delivery / logistics causing concerns. Those issues were resolved quickly by the Gorilla Sports team. Check out the impressive gallery, and read those comments for yourself over on the dedicated amazon.co.uk product page now!